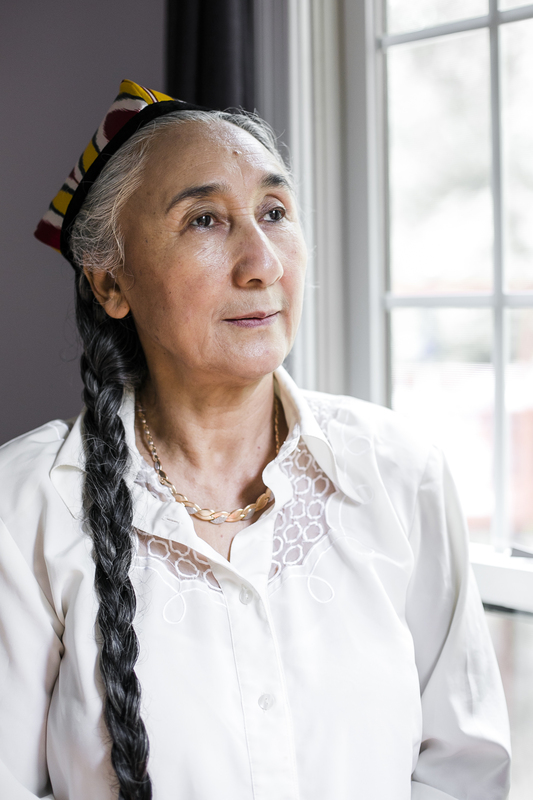 WASHINGTON—Rebiya Kadeer, a mother of 11 and one of the Chinese Communist Party’s top public enemies, waited for a cab in downtown D.C.
Rushing cars blew humid August air against Kadeer and her adviser, Omer Kanat, an exiled Uyghur researcher, as they discussed their talking points for the day. 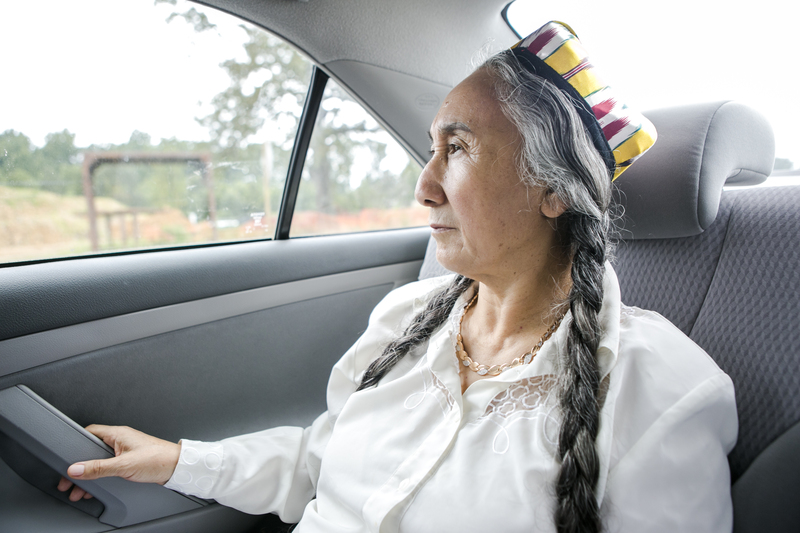 “Busy, busy, busy,” Kadeer said, as she got in a cab that would take them to a meeting with the Congressional-Executive Commission on China. She had met with officials at the State Department the day before. Kadeer is the most prominent dissident who speaks out for the Uyghurs, a central Asian people who are distant relatives of the Turks. They are a Muslim minority who live in northwestern China—a region that Uyghurs call East Turkestan and the Chinese Communist Party (CCP) calls Xinjiang, which means the new frontier. In 1949, the Chinese regime annexed and later colonized Xinjiang, a largely desert region in northwestern China that has mummies, snow-laden peaks, and cities buried in sand. Xinjiang is four times the size of California; most important, it has an oil-rich region that is the size of France. Its land is also rich with minerals and natural gas. China has invested billions in the region, and the natural resources of Xinjiang have played a large role in China’s economic growth. But the Uyghurs are not seeing much of the money from their economic boom. And the general public in the West has not seen much of their woes either. When compared to the Tibetans the Uyghurs are a relatively unfamiliar group, although they share a border and similar struggles with the Chinese regime. The Chinese regime conducted more than 40 open-air nuclear bomb tests in Xinjiang between 1964 and 1996, according to Scientific America. Radiation experts estimate that at least 194,000 people have died from exposure. From executions of political dissidents, to the destruction of mosques, to the decline of Uyghur language taught in Uyghur schools, the plight of Muslims in China had long gone unnoticed in the international sphere. That is, until Kadeer came along. Kadeer, a woman whose signature look is two long, traditional braids that go past her hips, does not appear powerful. At 68, Kadeer she is still somewhat girlish, with a slender frame and bright, probing black eyes. From the surface, one can’t tell that she is a great-grandmother who survived two years of solitary confinement in China. Although she has been beaten and humiliated and nearly died of a gory stomach illness during her five years in prison, there is still a salt-of-the-earth quality left in her personality. During a long car ride she giggled when she realized that, while she was talking, her adviser had fallen asleep. Even if she is running late for a meeting, she insists that all guests who visit her home must sit down and try one of her savory dishes such as the traditional Uyghur carrot and lamb fried rice. But the Chinese Communist Party is afraid of her, and rightly so. 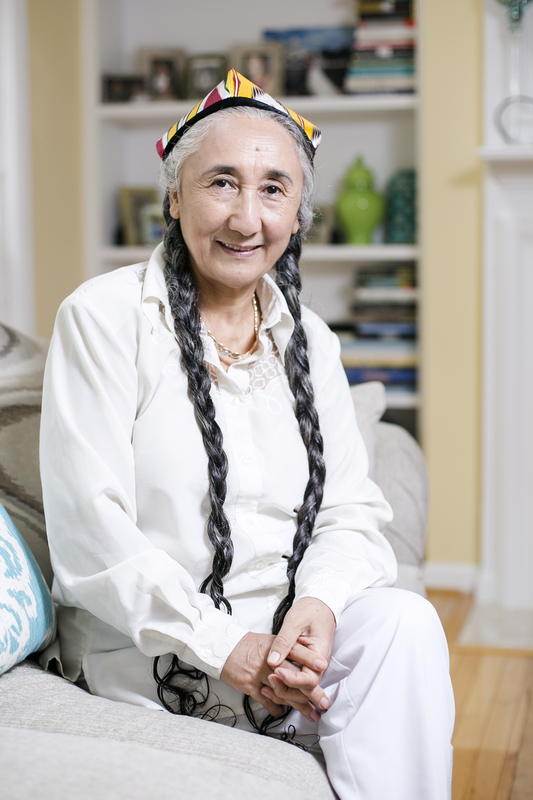 Kadeer has dedicated the past 50 years of her life to the Uyghurs’ cause. The Chinese economy is flailing and the Party’s rule looks vulnerable. This could be a pivotal moment that Kadeer could capitalize on to reach an agreement. After all, it would be in the Chinese regime’s best interest to reach an accord with the Uyghurs. The Chinese economy has been slowing down; Xinjiang is a critical place for China’s development in the coming years. Riots and unrests are not attractive to investors. Although the premise of the Cultural Revolution was to take down the bourgeoisie, it was precisely during the Cultural Revolution that Kadeer realized how much power money could buy. And, ironically, how much good it can do. The wire from his “Counterrevolutionary—Must Be Annihilated” sign was cutting into his neck. She reached for the 50 yuan in her pocket, money she made from selling children’s shoes that she sewed from scraps of corduroy and plastic, and discreetly handed it to the young man in charge. As riots in Xinjiang increased in the ’90s, Kadeer, who was the seventh richest person in China at the time, caught the eye of the CCP. The CCP asked her to be a special government “consultant” on Xinjiang issues. She naively believed she could help her people this way. Kadeer was appointed as a delegate of the Chinese People’s Political Consultative Conference—an official advisory body set up by the CCP—and the National People’s Congress, which is the CCP’s rubber stamp legislature. Jiang Zemin, leader of the CCP and China’s head of state at that time, asked her to represent the Uyghurs at the United Nations’ World Conference on Women in Beijing in 1995. As Hillary Clinton gave her speech at the podium, Kadeer sat in the audience, flanked by three translators who were not really there to translate. Whenever Kadeer tried to speak to an international representative at the conference, her interpreters would regurgitate Party propaganda. 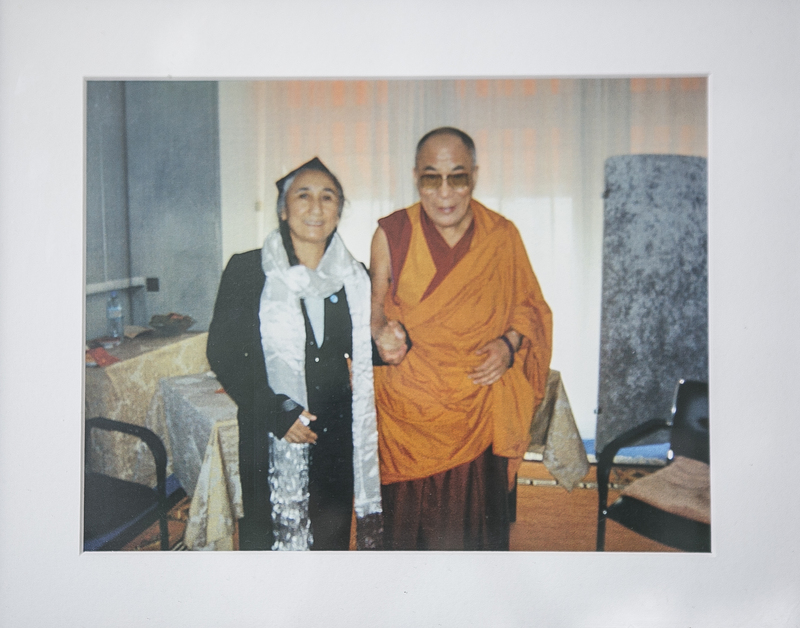 Kadeer thought of the nine Tibetan women she had seen gagging themselves with silk scarves outside the conference, reminding the foreign press that China was silencing the voices of its minorities. She thought about how organized the Tibetans were, and how they had the Dalai Lama to advocate for them outside of China. The Uyghurs had no one. At that moment, Kadeer decided she needed to fill this void for East Turkestan. Kadeer wrote a preapproved speech for the National People’s Congress. But that was not the one she planned to give. She was nervous. On the way to the stage, she accidentally tipped over a pitcher of tea on one of the tables. Three thousand congressional representatives faced her. She spoke for 27 minutes on impoverished farmers, a lacking education system, and the government’s violent treatment of political prisoners. She spoke of how the farmers aren’t allowed to take up manufacturing or other lines of work. Yet farmers don’t receive compensation when the Chinese regime extracts natural resources from their land. The regime also employs Chinese workers in preference to Uyghurs. She spoke about how tax burdens were suffocating Uyghur business people. They have to pay excessive amounts to Chinese middlemen, and they are prohibited from conducting business with other Uyghurs. Three months later, she was stripped of all her titles and responsibilities. Kadeer’s passport was also confiscated, as were her children’s and her brother’s. The regime forbade her from traveling between city districts without permission. Despite such warnings, Kadeer didn’t back down. With permission from officials, she started a Thousand Mothers Movement that empowered Uyghur women to start businesses. But she made the mistake of using the word “international” during one of her speeches. The CCP feared she would gain international influence and tightened its watch. Men in dark suits followed her. Before it was too late, Kadeer managed to send her second husband and her four youngest children to the United States. Kekenus Sidik, her youngest daughter, remembers leaving China at age 7. “I didn’t even know she wasn’t coming with us until we got on the plane and I saw that she wasn’t there,” Sidik said. Little did Kadeer know that she would go to prison within the next year for planning to pass on newspaper clippings to the U.S. Congress about a massacre in Xinjiang. She was charged with “leaking national security information,” even though the information was published in Chinese newspapers. Not until Sidik was 14 would she see her mother again. With combined efforts from organizations such as Amnesty International and Freedom House, Kadeer won the Rafto Prize for human rights while in prison, and it attracted international attention. Former U.S. Secretary of State Condoleezza Rice secured Kadeer’s release in 2005, when Kadeer was freed on medical grounds. As soon as Kadeer arrived in Washington D.C., her first instinct was to carry on with her activism. The Chinese regime has also enforced policies that aim to systematically eradicate Uyghur culture. Schools in Xinjiang are increasingly adopting Chinese as the primary language of instruction. Many urban schools teach only in Chinese. “Many of the young, college-educated Uyghurs with whom I’ve spoken genuinely fear that in the not-so-distant future Uyghurs will be mono-lingual Chinese speakers who know little about Uyghur history or Islam,” said Timothy Grose, an assistant professor of China Studies at Rose-Hulman Institute of Technology who specializes in Uyghur research. But it was difficult at first for Kadeer to carry on with the energy of her former self right after her release. She was mentally unstable after her imprisonment, especially after solitary confinement. In Kadeer’s memoir “Dragon Fighter: One Woman’s Epic Struggle for Peace With China,” she wrote about how for some time she’d sit in her kitchen in Virginia and relive old conversations. Ten years later, Kadeer has recovered and her mind is sharp—as sharp as it was when she turned a one-woman laundry business where she hand washed clothes in a shoddy apartment into a multimillion-dollar trading empire. These days, at events and meetings with the State Department and Commission on China, she discusses the global Uyghur refugee situation and the CCP’s confiscation of Uyghur passports. Remarkably, Kadeer has managed to get funding from the National Endowment for Democracy and private donors for the two organizations she heads, the Uyghur American Association and the World Uyghur Congress, at a time when it is very difficult for Muslim groups to receive financial support. After the initial arrest of her children, Kadeer gave a firm Radio Free Asia interview stating that she won’t give up her activism. After the microphone turned off, she burst into tears. The ‘Osama bin Laden of China’ or The ‘Dalai Lama of Xinjiang’? Since Kadeer’s release from China, the Uyghurs’ efforts to tell their story have become more organized and effective—holding conferences across the world and meeting with government officials not only in the United States but also in Europe and Australia. When the United States turned its foreign policy focus on counterterrorism after 9/11, China took the opportunity to form an alliance with President George W. Bush, insinuating that the Uyghurs were connected to global terrorist groups. There is a small group of Uyghurs called the East Turkestan Islamic Movement who react violently to the Chinese regime’s policies. This is one of the reasons why Uyghurs have not received as much sympathy from the West as Tibetans, even though the terrorism claim is unsubstantiated. “They are mostly interested in the liberation of East Turkestan, not global jihadists’ goals,” said Gladney, noting that the practices of al-Qaeda—such as suicide bombers, infrastructure tax, and large sophisticated weaponry—do not appear in violent Uyghur attacks. Bush has since then recognized that Uyghurs are not connected to jihadi. Kadeer met privately with President George W. Bush at a 2007 conference on democracy and security in Prague, where he praised Kadeer as “far more valuable than the weapons of [China’s] army or oil under the ground,” according to an archived White House press release. The Uyghur American Association in D.C. spends a lot of time investigating and debunking rumors that claim random tragedies—such as the catastrophic explosion and fire earlier this month in Tianjin, or the Aug. 18 bombing of a Buddhist shrine in Bangkok—are the work of Uyghur terrorists. For Kadeer’s children who still live in Xinjiang, many of them are in a dire situation. They are living under house arrest and barred from finding employment. They are also not allowed to receive financial support from Kadeer. Kadeer and Kanat rest at a Pret a Manger after a meeting. They order hot milk tea even though it was a sultry afternoon. Michael Bublé’s “It’s a Beautiful Day” blasts from the stereo, but Kadeer’s thoughts are deeply moored in East Turketan. Although Kadeer was twice nominated for the Nobel Peace Prize, she knows she has not completed her life’s work. Her work ahead is difficult, for there is a division among Uyghurs. Kadeer doesn’t worry and focuses on what she can do presently. Whenever an opportunity comes up, she leaves in a jiffy. “Sometimes I don’t even know she has left the country until she calls from another country,” her daughter Sidik said. 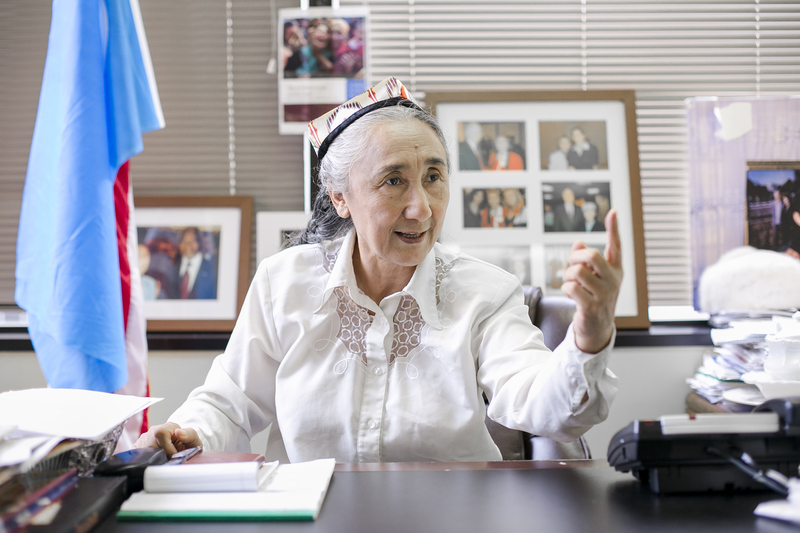 Kadeer frequently travels and speaks to media around the world—from Australia, to Germany, to Japan, where she was re-elected president of the World Uyghur Congress in 2012. Worse yet, another difficulty that Kadeer faces is the ever changing nature of U.S.–China relations. President Bush had received Kadeer at the White House. But the Obama administration, which has invited the Dalai Lama, did not invite Kadeer. Kadeer has earned the respect of officials in Washington though, according to S. Frederick Starr, chairman of the Central Asia-Caucasus Institute, who has attended meetings with Kadeer. “However, the disinterest of the Department of State … has limited Ms. Kadeer’s impact, unfortunately,” Starr said. Another setback is that the Uyghur American Association is working with a limited staff of six. Kanat was hospitalized for heart pains on a Sunday, Aug. 23. He continued to make work calls from the hospital and returned to the office the following Wednesday. “We are very few people, but we have a lot of problems with the Chinese government,” Kanat said. Still, there is the issue that the Uyghurs are not as famous as the Tibetans. Kadeer is unnoticed most of the time when she walks the streets of D.C. and dines in its restaurants. If the Dalai Lama were in such public places, it would be a different scenario. But Kadeer is not discouraged by that. She never has been. When Kadeer was an uneducated Muslim housewife, her community said that her life was over after her first husband—whom she had six children with—left. Yet after the divorce, she became a business tycoon. 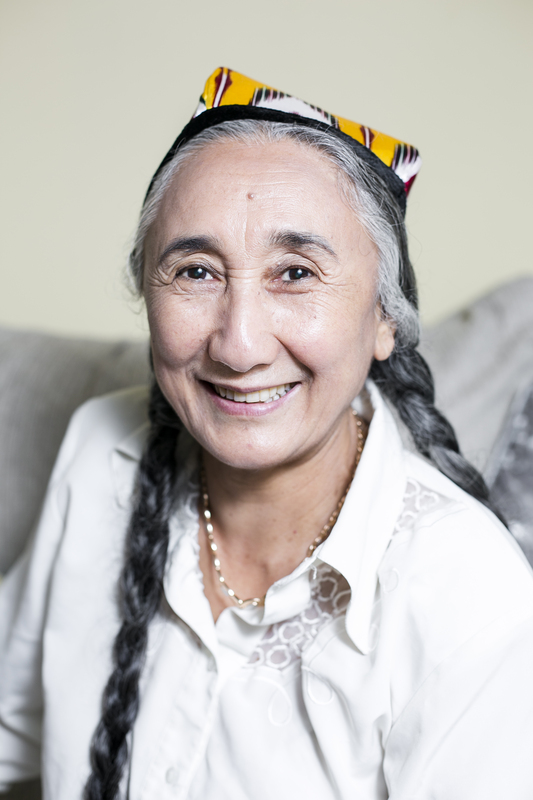 So what would stop Kadeer from believing that she can bring freedom to the Uyghurs? She expects to return to an autonomous East Turkestan within the next 10 years. Even though she’s lived in the United States for a decade, she still keeps a Chinese passport.